I know that it is past the Christmas season and I should be focusing on other things, but I've been working on prototypes for miniature glitter houses again. These are much smaller than my previous houses. They would be appropriate as ornaments for a Christmas tree or as a village scene in 1:24 scale. This is the first of 5 houses. 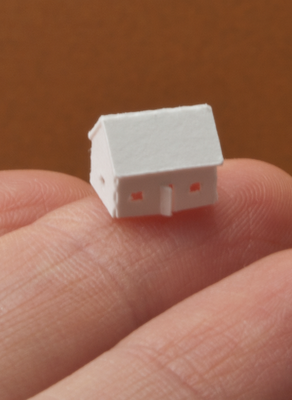 It is .25" (6mm) tall and is modeled after my own house (a Cape Cod style). This prototype is cut from white paper, but the actual houses will be in pretty colors. I think I am addicted to making glitter houses! smaller and smaller? where you're going? ah ah! if you're still interested, I wrote the recipe for eel in my cooking blog! Complimenti e Felice Anno Nuovo! Incredible work, congratulations and happy new year!